Camino de los Condores 225, Lo Barnechea, Farellones. Bearing in a privileged location, this hotel offers its guests family ski trips, a handy connection to Chile’s three main ski centers, which, as a whole, cover the largest ski area in South America, namely: La Parva, El Colorado- Farellones and Valle Nevado. First Chile Ski Lodge. 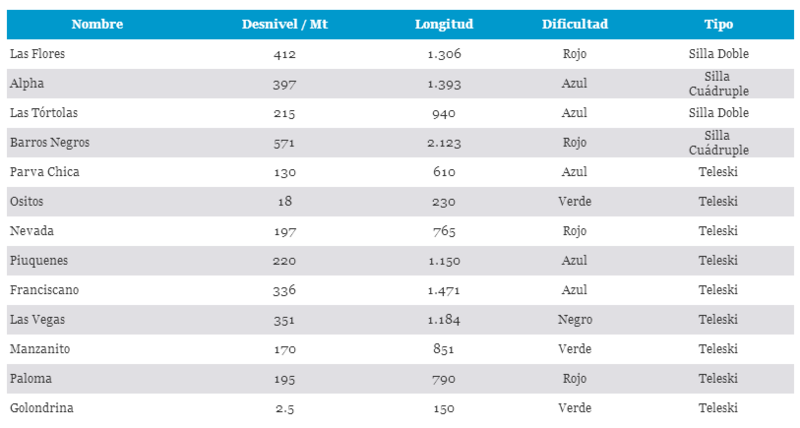 These are the most important places to ski in Chile and larger than Argentina ski resorts. 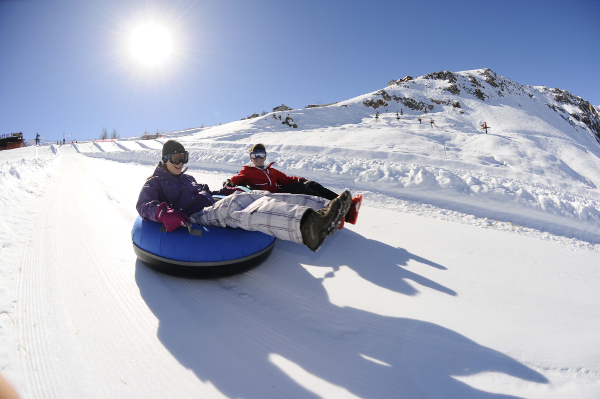 Farellones ski resort is the smallest in the area, capable and excellent chance for a beginner family ski trip with ski school teachers and tubing park. Here, skiers will be able to enjoy the majestic view of sky-scraping mountains surrounding the hotel, the most modern ski lifts available in the country and excellent ski tracks, ideal for all kinds of skiers. 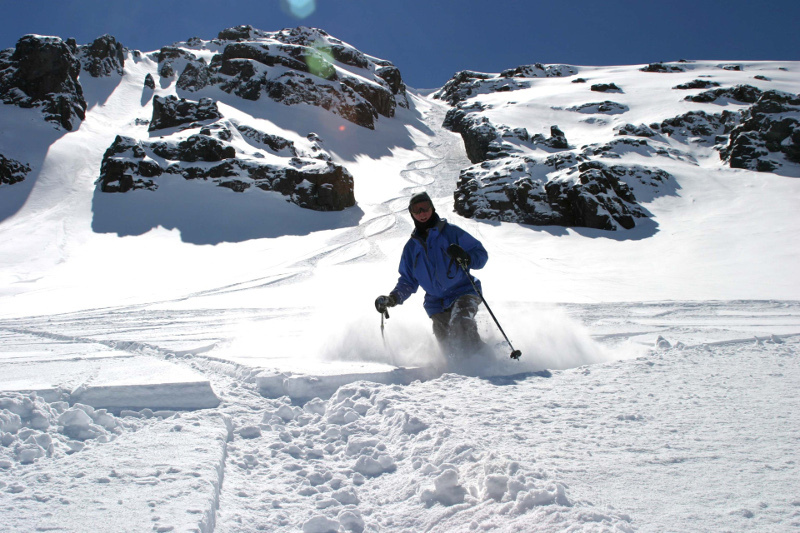 You can enjoy skiing in Chile, from June to October for an unforgettable family ski trip. 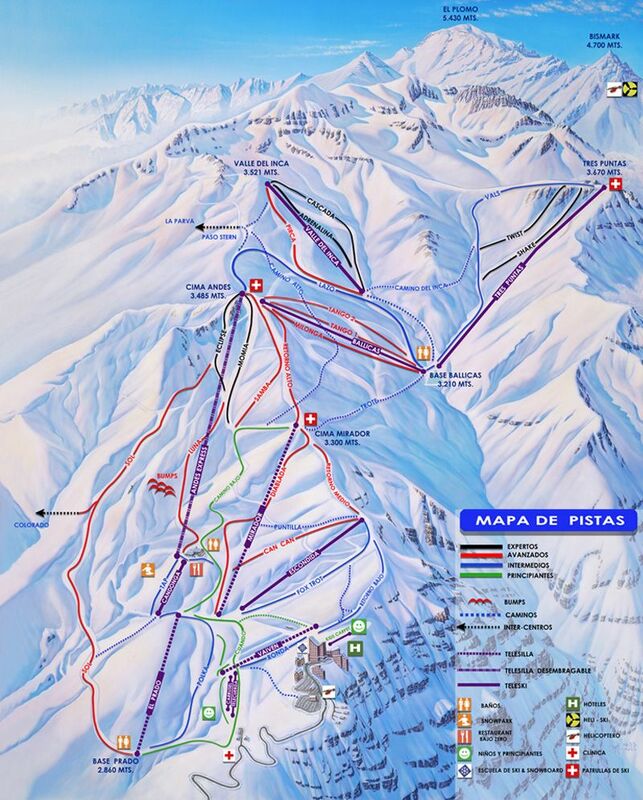 La Parva is a part of Three Valleys of Chile, together with Valle Nevado and El Colorado ski center. La Parva quickly rises to 3.630 meters (11.910 feet), and steep climbs it offers easy access to areas out of track much like The Chimney, with deep gorges, and cornices. Also it provides a clear opportunity to photograph from the top of the mountains of world class and a passage without equal like Cerro La Parva and La Falsa Parva. You may plan a day skiing trip from the Colorado ski resort. 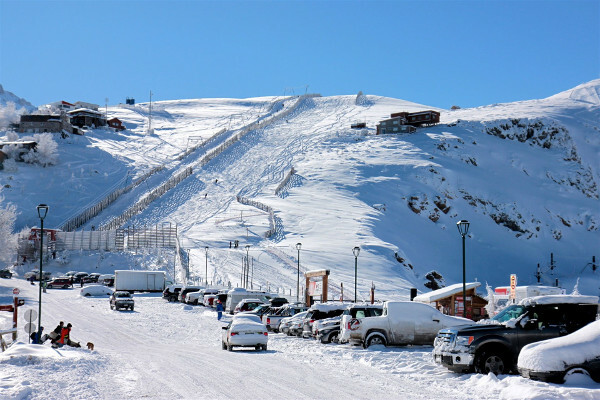 This ski center as La Parva has the advantage to cross in to Valle Nevado by means of the ski lifts that rise to the summits. The east face this one of the cone of The Colorado (local name El Cono Este), in general has the best snow since product of strong winds they accumulate big snow quantities here; the best skiing heavens powder in South America. 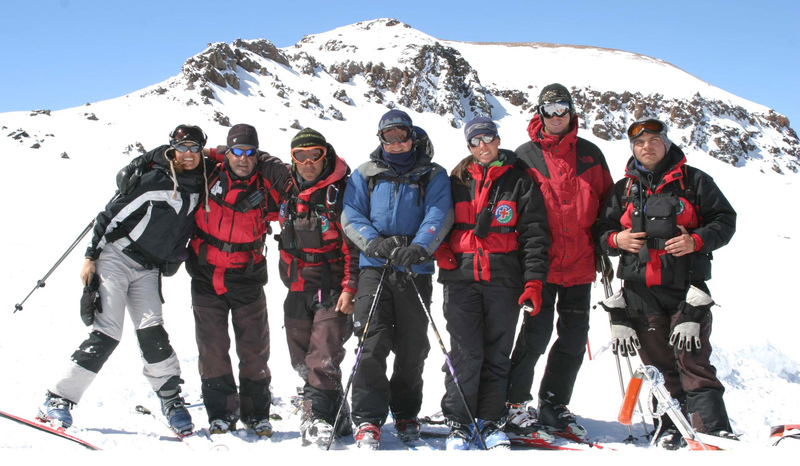 Top range skiing trip without a helicopter also is available in Santa Teresita, well known for the expert riders getting from Colorado Ski resort and skiing down the virgin area to the main road of Valle Nevado where a van will met our clients. Covered with Valle Nevado, it has 25.000 hectares, and light snow is famous for experimented skiers, along places with phenomenal sight of the Mountain range of the Chilean Andes. This complex offers us amazing places to ski, marked trails, excellent off- piste and fantastic conference in the shade of the Andean Condor that often they fly over us. Here, you can go so highly as 3.670 meters (12.400 feet) on the sea level. If you look in your family trip to Chile for the possibility of flying and ski, Valle Nevado also offers Heli ski in the nearby peaks with amazing skiing areas full of fresh powder. • Elevation: 2.700 Mt / 9000 Feet. • Interconnection from Cono Este: 3.150 Mt / 10.500 Feet. • Distance from Hotel: 5 Km. • Ski School / 40 Ski Instructors. • 7 Snow grooming machines. 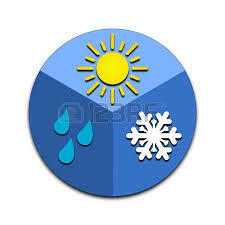 • Run from: 9:00 a.m. to 5:00p.m. 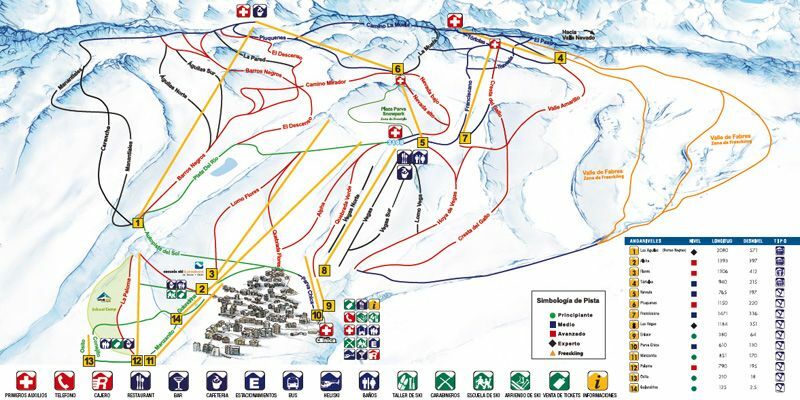 • Ticket value / adult ski (weekends, Holidays and high season) . • Ticket Value / adult ski (days of week). • Young Ticket value Ski (days of week). • Ticket value Senior Ski (greater 65 years). • Skiable Domain: 1.000 H / 2.500 acres. • Total Groomed: 230 H / 575 acres. First surface lift 1.000 yards from hotel, connecting through Los Zorros, the Colorado’s Base. • Open from: 9:00 a.m. to 5:00 p.m.
• Elevation: 3.025 Mt / 9.167 F.
• Top elevation: 3.670 Mt / 11.121 F.
• Groomed Trails: 130 H 8 325 acres. • Skiable Domain: 9.000 H / 22.500 acres. • Interconnection to La Parva & Colorado. Ski the three valleys starting in Farellones. Hotel Posada de Farellones is located only 20 minutes away from Valle Nevado and we will transport our guest to the majestic of the Chilean Andes. 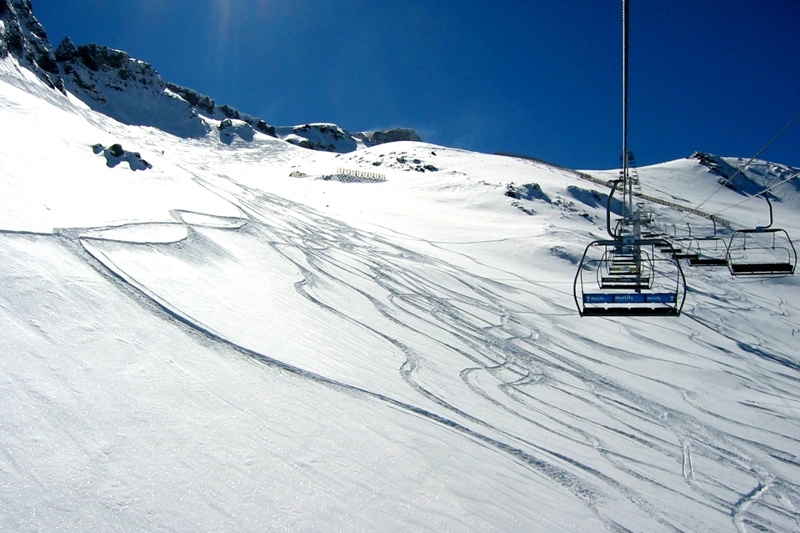 Ski in Chile, is the majestic of this side of the Southern Hemisphere. • Elevation: 2.700 Mt / 9.000 feet. • Top elevation : 3.720 Mt / 12.400 feet. • Groomed trails : 150 H / 375 acres. • Esquiable domain : 750 H / 1.875 acres. 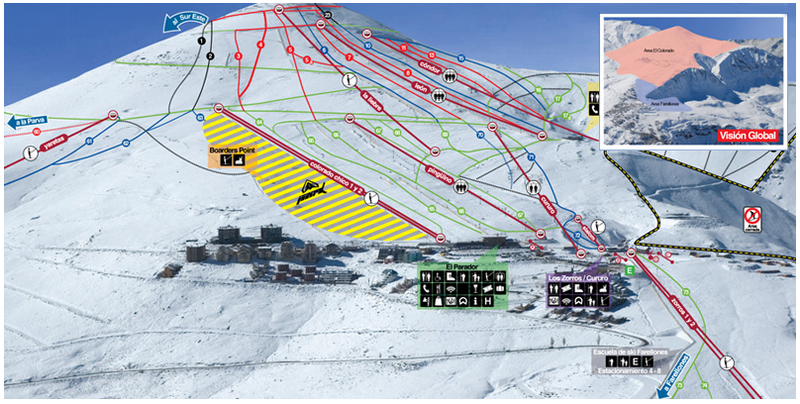 • Interconnection from El Paso to Valle Nevado: 3.520 Mt / 11.733 feet.